• How do you Secure VMWARE across the enterprise? • How do you Protect your virtual infrastructure? • How do you Control privileged users in a virtualized environment? • How do you Integrate with your current security investment? 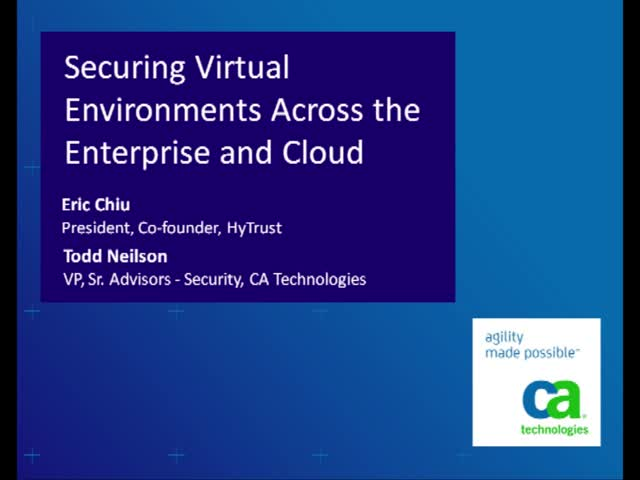 Technology alliance partners CA Technologies and HyTrust, Inc. have collaborated to further improve security and compliance for customers leveraging virtualized systems and cloud infrastructures with CA Access Control for Virtual Environments. Todd Neilson, VP, Sr. Advisor – North America, Security, CA Technologies, & Eric Chiu, President & Co-Founder, HyTrust, Inc . Presented by: Todd Neilson, VP, Sr. Advisor – North America, Security, CA Technologies, & Eric Chiu, President & Co-Founder, HyTrust, Inc .